This series is comprised of different parts, listed below. In part 1 of this series, you configured your LAB for a 2 tier PKI hierarchy running on Windows Server 2016. You used PowerShell to create some virtual machines, and then installed Windows Server 2016, Windows 10 Enterprise version 1803 and optionally Smoothwall 3.1 before configuring the IP address scheme and Computer Names on the virtual machines. 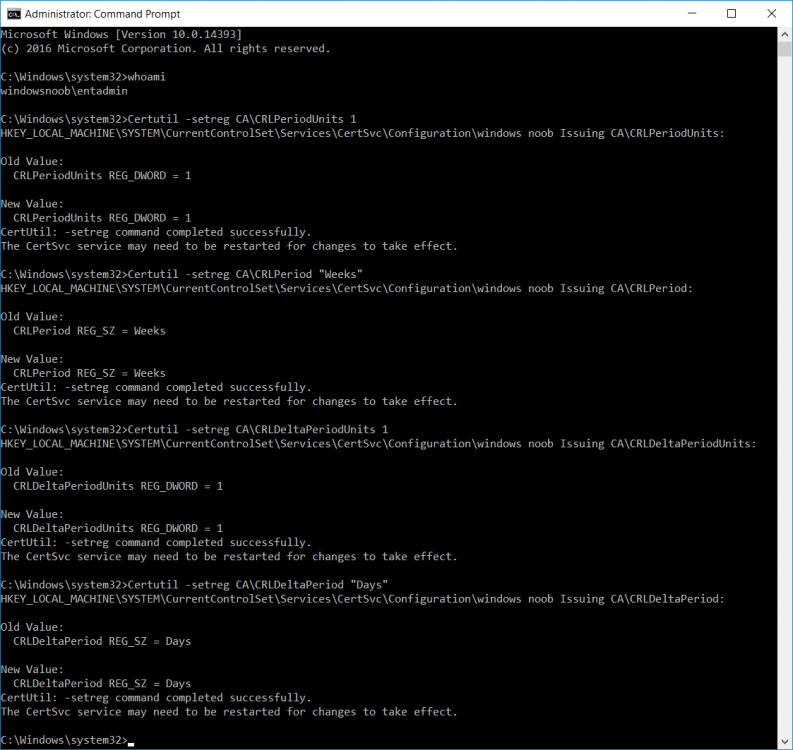 Finally you configured ADDS on DC01 so that you have a working Domain Controller for the rest of this LAB. In part 2 you installed and did the initial configuration on the Standalone Offline Root CA. In part 3 you prepared the HTTP Web Server for CDP and AIA Publication and you created a DNS record for the publicly available web server. In part 4 you performed post configuration on the Standalone Offline Root CA to set certificate revocation list (CRL) period registry settings using CertUtil, and then enabled object access Auditing and finally, you configured three locations for the Authority Information Access (AIA) and four locations for the Certificate revocation list Distribution Point (CDP), again using CertUtil. 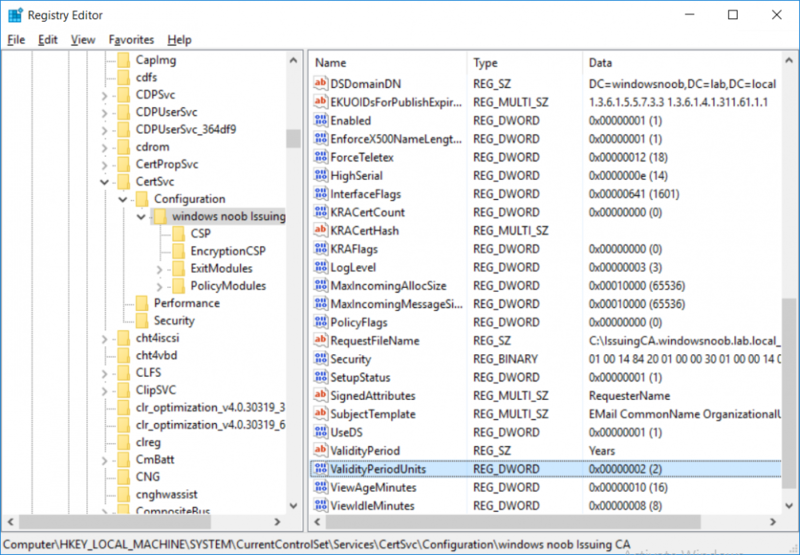 In part 5 you joined the IssuingCA computer to the windowsnoob domain before creating a new CAPolicy.inf file which was customized for the Issuing CA role. Next, you published the Root CA Certificate and CRL (both to Active Directory and the HTTP webserver) and you installed the Enterprise Issuing CA before submitting a request to the StandAlone Offline Root CA. Next you installed the Issuing CA Certificate using the response files from the StandAlone Offline Root CA on the removable media. In this part, you will perform post installation and configuration of the IssuingCA server. 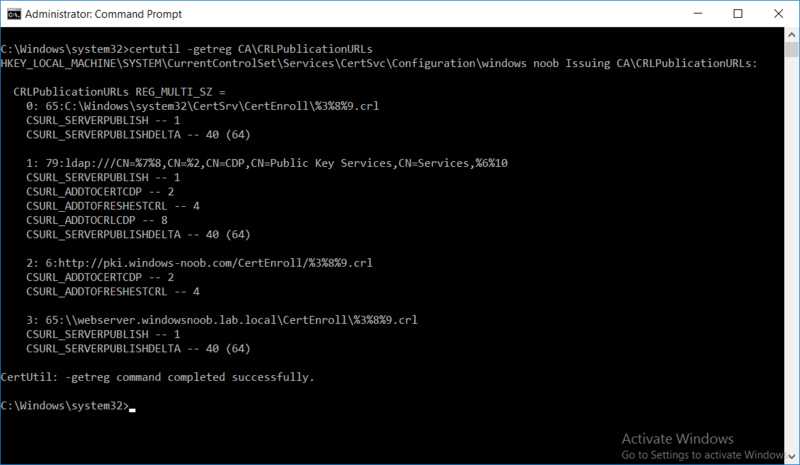 To configure certificate revocation and CA certificate validity periods ensure that you are logged on to the IssuingCA server as windowsnoob\EntAdmin (you can use whoami in the command prompt to verify which user is logged on). The output of the above commands is shown below. 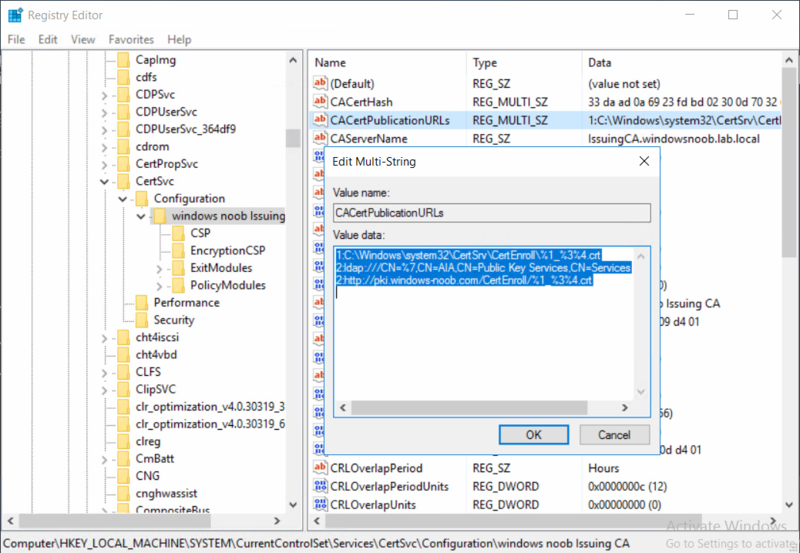 The default setting for ValidityPeriodUnits for certificates issued from the IssuingCA server is 2 years in the registry as shown here (HKLM\System\CurrentControlSet\Services\CertSvc\Configuration\windows noob Issuing CA). You can adjust this setting depending on your needs to define the lifetime of certificates issued from the IssuingCA server. It is recommended that you don't configure validity periods that are longer than half the total lifetime of the windows noob Issuing CA certificate (which was issued to be valid for 10 years based upon settings configured in the CAPolicy.inf you created on the IssuingCA in part 5, in particular, this line). Press enter. The output of the above commands is shown below. 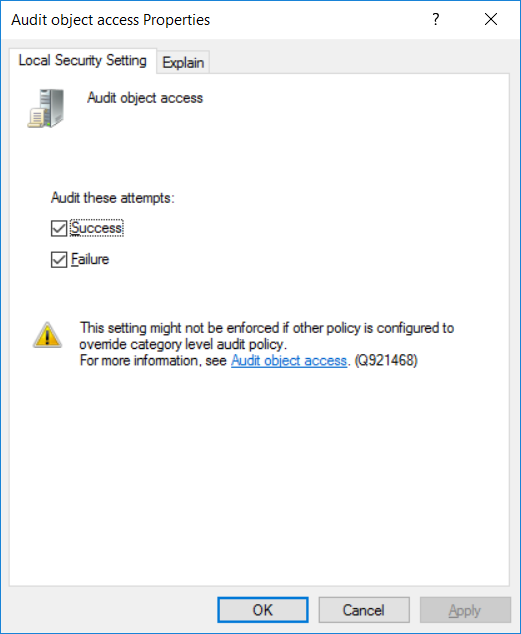 CA auditing requires system Audit Object Access to be enabled. To use Local Security Policy to enable object access auditing do as follows. Click Start, click Administrative Tools, and then select Local Security Policy. Expand Local Policies and then select Audit Policy. Double click Audit Object Access and then select Success and Failure then click OK. The results of that command are shown below. a http location for the AIA. To configure AIA using certutil, open an administrative command prompt and enter the following command, pay close attention to the http address it's currently pointing to my http webserver. 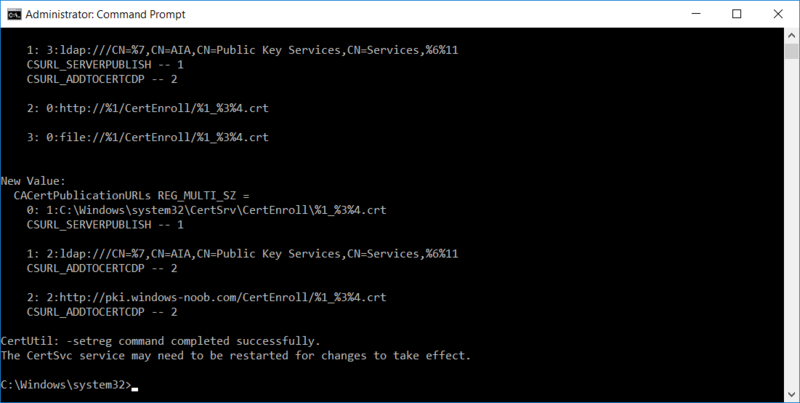 certutil -setreg CA\CACertPublicationURLs "1:C:\Windows\system32\CertSrv\CertEnroll\%1_%3%4.crt\n2:ldap:///CN=%7,CN=AIA,CN=Public Key Services,CN=Services,%6%11\n2:http://pki.windows-noob.com/CertEnroll/%1_%3%4.crt"
You can also see this in the the CA (certsrv.msc) console. Click Start, select Administrative Tools, and then click Certification Authority. 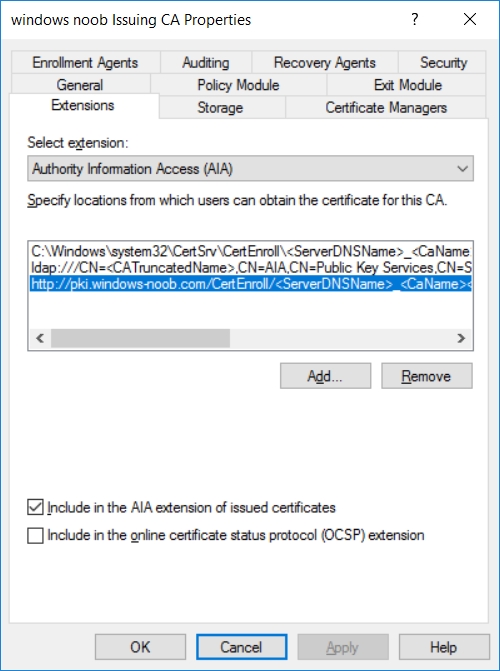 In the navigation pane, expand the Certificate Authority (Local). Right-click windows noob Issuing CA and then click Properties. On the Extensions tab, under Select extension, click Authority Information Access (AIA) and you will see the graphical representation of the AIA settings. 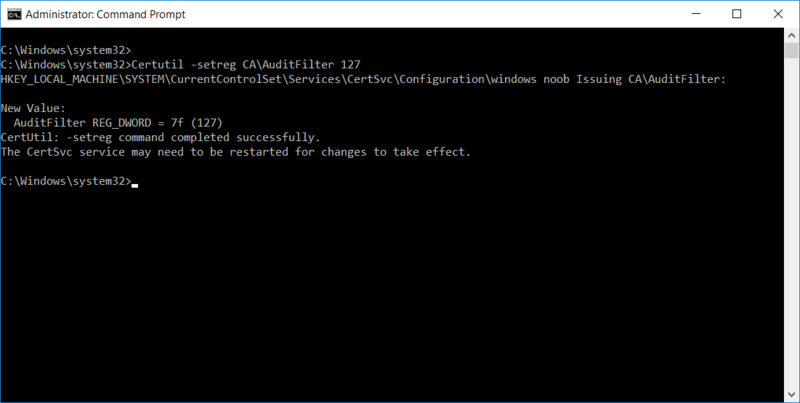 To copy the windows noob Issuing CA certificate (crt file) to the http AIA location, use the following command on the IssuingCA server while logged in as windowsnoob\EntAdmin, your CRT file will more than likely be named differently, so change the command below accordingly. Note: The file system location that you set will allow the CRL to be copied over the network to the web server (webserver.windowsnoob.lab.local), which is why we earlier allowed the Cert Publishers group access to the share and folder. All CAs are members of the Cert Publishers group, so we effectively allowed all CAs to copy to the CertEnroll folder on the webserver. Some administrators decide to configure a separate group of specific computers for that purpose or even grant permissions to the CAs individually. 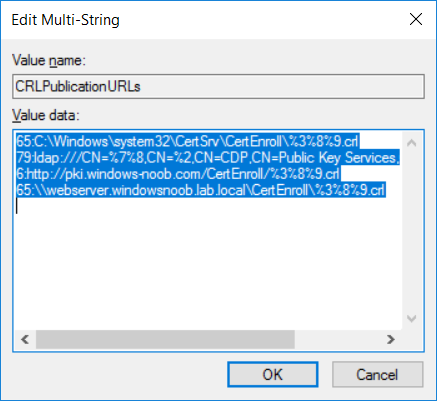 certutil -setreg CA\CRLPublicationURLs "65:C:\Windows\system32\CertSrv\CertEnroll\%3%8%9.crl\n79:ldap:///CN=%7%8,CN=%2,CN=CDP,CN=Public Key Services,CN=Services,%6%10\n6:http://pki.windows-noob.com/CertEnroll/%3%8%9.crl\n65:\\webserver.windowsnoob.lab.local\CertEnroll\%3%8%9.crl"
Using an administrative command prompt, start PowerShell, then run the following commands to restart Active Directory Certificate Services and to publish the CRL. That's it for this part, join me in Part 7 where you will Install and configure the OCSP Responder role service.